First things first, if you think your dog ingested a toxic plant, stop reading now and call your vet immediately! You may also call the Pet Poison Helpline 24/7. There are many plants that are toxic to dogs, so identifying the plant is going to be very helpful to your vet or the Pet Poison Helpline. If you do not know the name of the plant your dog ate, then take a picture of it. You can use the PlantSnap app to try and identify it. Alight, hopefully, you are here for preventative education and not because your dog has just eaten a toxic plant. I recently attended the Pet Poison Helpline Pets vs Toxic Plants: How to Tilt the Balance to Favor Your Patient live webinar so I want to share a few things I learned. I love planting my garden outside; vegetables and perennials are my favorites. Although annual plants have some great color, I’m all for a good investment that comes back to me each spring. As much as I love to garden, I love my dogs even more. And there are so many plants that are harmful to dogs. It’s April here in Wisconsin, and this spring has been good to us so far. If you are from the Midwest, you know how the unpredictable the weather can be! There is still always a threat of snow, but I’m being hopeful this year we will skip over that stage and go right into summer! But to be safe, I won’t plant anything new until the end of April to the beginning of May. We just moved into a new home in the country last summer, and will be working on building an addition this spring… so I have a lot of landscaping work ahead of me. I want to make sure I don’t plant anything that is poisonous to my dogs. And boy was I surprised to see many of my favorite perennials on the toxic to dogs list! There are 410 plant names on the toxic to dogs list! So I have a big decision to make, plant my favorites anyway and make sure the dogs never eat them. Or stick with the plants on the non-toxic list. I love having plants all around inside our house too. Plants are magically, supplying us with fresh oxygen, and improving our overall air quality. My resident dogs have no desire to eat my houseplants… but I have had foster puppies trying to make a meal out of a few! This is why I have to ensure the plants I have on the floor are NOT toxic to dogs. If you own any of these plants, make sure to keep them out of your dogs reach. Simply setting them on a shelve or table is the easiest way. The ASPCA has a complete list of toxic plants and non-toxic plants. It has full-color photos and details of each plant. I thought about listing them here but seems silly to re-list such a complex list that they did such a great job creating. NOTE: This list does not include plants that are toxic to cats or other pets. This is a dog-only list. Ginger and Bear prefer to eat grass and have never tried to eat my garden plants. So I’m not too worried about them eating a poisonous perennial. What would you do? Would you plant something you know is toxic to your dog, hoping he won’t eat it? Or would you stick with the plants on the safe for dogs list? I was disappointed to learn that Lemongrass and Lavender plants are harmful to dogs also. Both these plants are said to repel mosquitos, which I was hoping to add around our new patio. I guess I will need to second guess that choice. We not only need to worry about our dogs, but wildlife coming in for a snack or full meal. For your vegetable garden, I recommend installing a fence like this to keep your dog and rabbits out. Never leave your dog unattended around your garden. Use ornamental fencing to keep your dog away from the toxic plants. Train your dog he is not allowed near the garden area. I love the idea of sharing my garden with my dogs! 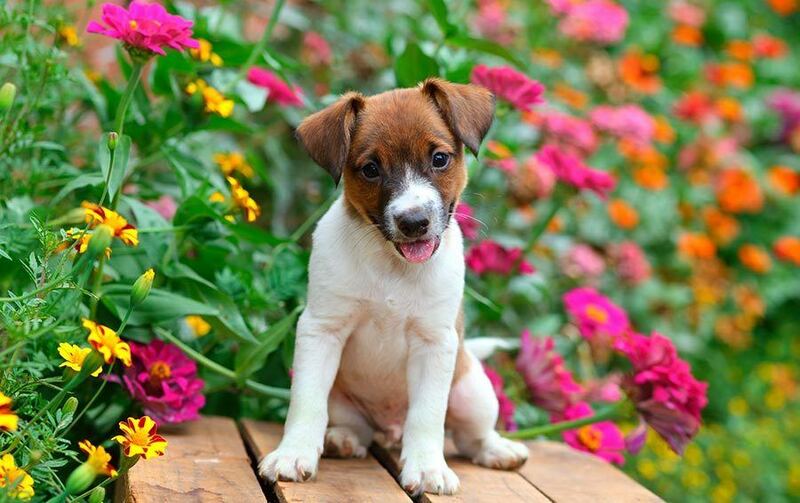 Plant non-toxic plants and invite your dog to enjoy the beauty with you! Consider planting a patch of dog-safe tall grass so he can have a nibble. Download the list and bring it to your local garden nursery. They should be able to help you choose the best non-toxic plants for your location. When you are done the planting, please share a photo of your dog-friendly garden on Instagram and tag @RescueDogs101. I can’t wait to see it! Remember to download my custom Excel doc of all the toxic and non-toxic plants. This is an extensive list, so I set it up so you can sort by plant name, scientific name or even the species family name!